Line a baking sheet with some tinfoil. 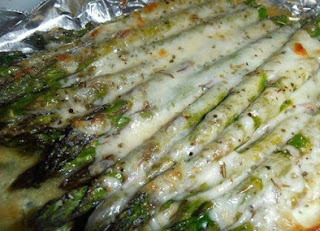 Place the asparagus on the baking sheet and drizzle with the melted butter. Sprinkle the house seasoning and Parmesan cheese over the top. Place in a 400 degree oven for 15 minutes. Remove and top with the mozzarella cheese and a little sprinkling of Italian seasoning over the top. Return to the oven for an additional 5-7 minutes to melt the cheese and let it begin to brown.